Enjoy 3 nights at the Intercontinental Resort & Spa Moorea, home to the popular Moorea Dolphin Center and Sea Turtle Clinic, 4 nights at Bora Bora’s best value, full service resort: Maitai Polynesia and then 3 nights at their sister property: Maitai Rangiroa situated on a large coconut plantation bordering the lagoon. 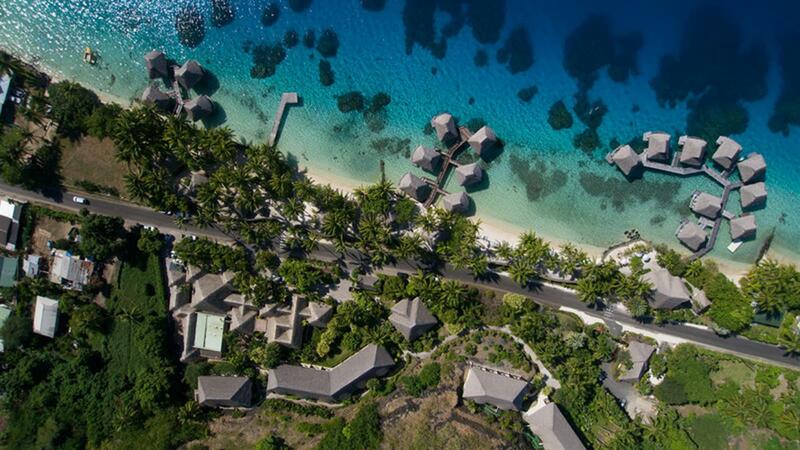 Because of its stunning scenery and heart-shaped formation, it's no wonder so many people fall in love with Moorea! Truly, the most romantic island in the world. From the dramatic scenery to the privacy and amenities of the overwater bungalows, everything in Bora Bora equals a 10 on the romance scale. The Endless Lagoon, Rangiroa is a string of coral encircling a luminous turquoise and jade-green lagoon. Package includes Full Breakfast daily, a Tahitian Black Pearl for the Bride and special Hotel Honeymoon Bonuses such as Champagne or Tropical Flowers.